Many of us start back in August (or even July!) but where I grew up in Oregon, we always started in September. I love the start of a new school year and all the possibilities it brings. I also love to be organized and always have easy, no prep ready to teach activities that I can pull out when I need. Here are a few of the activities we will be doing this month from my No Prep August Kindergarten Pack. These packs are so nice to have on hand each month, because they teach the standards with fun, engaging activities. I made them to hit the standards we are working on in each month – so they are developmentally appropriate and not just “busy work”. The activities progressively get harder throughout the school year and are perfect for small groups, whole group, homework and more! I added some FREEBIES to this post so you can try them with your kiddos! I organize each monthly pack in a flexible, 3-pronged folder with page protectors. This way I can easily see the activities and skills and I can pull them and quickly make copies. Having an entire month's worth of activities in page protectors makes it so easy to find what I need and stay organized. I have all language arts/reading activities together and then the math. At this point in the year, most of my students haven’t mastered the alphabet. In fact, most of my kinders start school not being able to recognize the first letter in their name. We do a lot of letter recognition, capital and lowercase matching and first sounds in August and September.These activities are wonderful if your kiddos can’t quite write their letters yet (I try to stay away from tracing letters until I teach them the correct directionality for each letter. )They are super simple and straight forward - perfect for the first couple weeks in kindergarten. We also work on CAP skills, syllables and labeling. This month is all about back to school! For scaffolding, I made two versions of the labeling. For the first month or so of school, most of my kiddos need the activity that has the words already written in each box. Then they can look at the letters and match the words. A few of my higher kiddos can use the version that doesn’t already have the words. 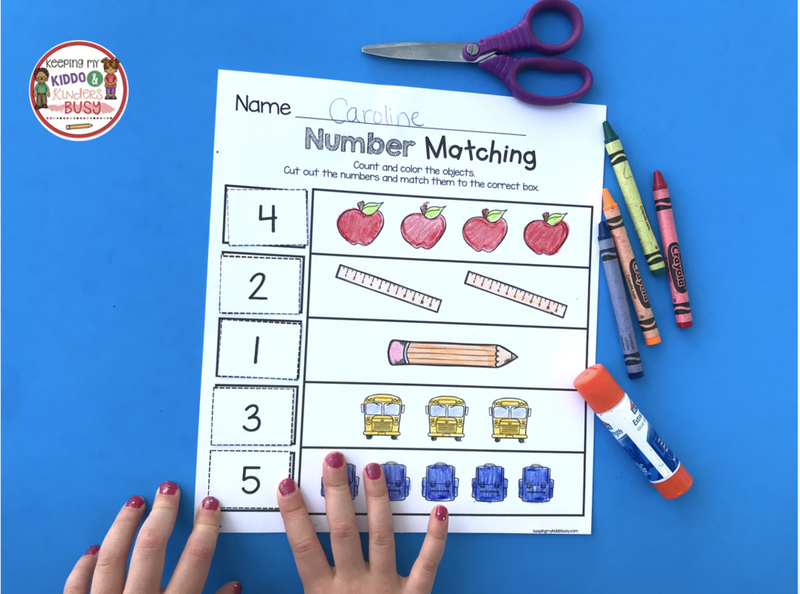 These worksheets are perfect for August or September in kindergarten. These cute animals match the book Brown Bear, Brown Bear. Students are practicing tracing lines, hand-eye coordination and matching skills. All of my monthly no prep packs come with these adorable emergent readers. My students look forward to them each month, and once I teach them my expectations... they know the routine! They are awesome for practicing sight words, vocabulary, CAP and fluency. We start the year doing them whole group, and then they move to a literacy center for the rest of the year. Each month, I give my students a goal setting sheet and writing sample. I keep these in individual folders for my students, and at the end of the year we have a fun portfolio for parents. How fun are these Color Coordinating worksheets?! They are perfect for back to school! All of the activities in these monthly packs are Common Core aligned, and in August we start very simple. We start with numbers 1-3 and just practice basic counting and 1:1 correspondence. There are a few activities to choose from, but we only go to school about 8 days in August so I just choose a couple to start based on where my kiddos are at. Save money by purchasing in BUNDLES! Grab this FREE year-long Kindergarten Curriculum Map! Sign up below and access them all right away!